Coffee and a Book Chick: Alas, I Have Not Hopped. For Shame! Alas, I Have Not Hopped. For Shame! The question is..."What 2011 summer release are you most looking forward to?" 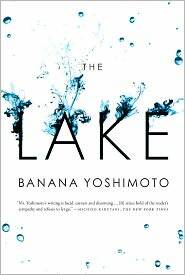 The Lake, by Banana Yoshimoto. Dolce Bellezza brought it up recently, and since I think I'll be joining her Japanese Literature Challenge this year, I thought this would fit nicely into it. So sorry if this post popped up in your Google Readers three times...I'm trying all sorts of stuff with the iPad and some of them work, and some of them I need to get used to...apologies all around! I must read some of this authors work. I have had Kitchen for ages! Another author that I have on my list! Sounds great, and the cover is really, really attractive to me (as in: pleading me to read it). I read Goodbye Tsugumi, which was a fun but strange book. But Lake sounds like it's one I'll want to read too. I really want to get an iPad! My excuse would be it makes life lighter!!! The book sounds absolutely amazing and i will be putting it on my wishlist in a minute! Don't feel bad...I've never hopped. It is all I can do to just read and review things! Ha! I've not read Kitchen but it has been on my list almost since I started blogging. I am really looking forward to The Ridge by Michael Koryta. Lighthouse? Evil forces? Yeah baby! I have heard some really good things about this book, and have been wanting to read something from Yoshimoto for a long time. I think that this will perhaps be the one to start with. Like Sandy, I have never hopped before, but that might change in the future! Haven't heard of it before, but it sounds really interesting! This book sounds incredible, I'm amazed I haven't heard anything about it! :) I'll definitely be adding it to my TBR list. Thank you for sharing, and have a good weekend! Thanks for the tip on this new book: I haven't read Yashimoto for a while and this could be just the ticket back to her work! I have somehow missed this author and I don't know if I would have picked this up from the cover but the description has me intrigued. This is now on my TBR list. Hopping over from the book hop. We have some of the same books that we have read or in my case gonna read. I have to say, I bought "the Historian" but have yet to read it. Was it good??? hope you can stop on by and check me out. Sounds interesting. Striking cover too. oh man! that looks SOOO interesting. i will have to add that to my list. I can't wait for this one either! Hope it comes out as an ebook. I read some of Banana's books in last years JLC - I'm really looking forward to this one too. I love her work. I also like the cover of this one (hope that's what it'll look like is Aus). This is definitely one I'm looking forward to as well! I think I'd like to read some of Kazuo Ishiguro's things first. Which would you recommend? And I've heard that Game of Thrones the HBO show sticks pretty close to the book. Are you watching the show? Hi, I just joined the Blog Hop! Your blog called out to me because I, too love sipping coffee while hovered over a good book. I'm not familiar with this author, but the cover and description are very enticing! I'm not a big reader of Japanese lit, but I've seen this one on Bellezza's site too, and my interest is piqued!! !